SANTA MONICA, CA – Here at Millionairium, we are not afraid to admit it: SEO is a lot of work. White hat techniques require real effort. After all, the things that white hat SEO requires are all big commitments (which is why a team of specialists is key). Let’s take a look at a few of the basics of white hat content: quality content, site optimization, link baiting, guest blogging, internal linking, and semantic markup. 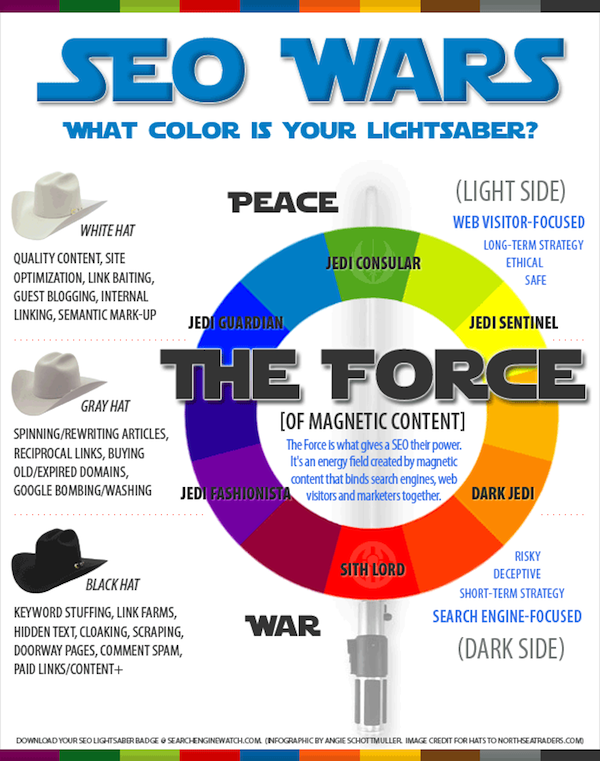 The differences between white, gray and black hat marketing efforts are described to perfection in the form of a clever picture titled SEO Wars: What Color is Your Lightsaber, featured in a recent article by Angie Schottmuller of Search Engine Watch. The definitions of gray and black hat seo practices are also made more clear by this picture. The gray hat area of SEO techniques include: spinning/rewriting articles, reciprocal links, buying old/expired domains, and Google bombing/washing. Black hat techniques include: keyword stuffing, link farms, hidden text, cloaking, scraping, doorway pages, comment spam, and paid links/content+. Keep in mind that both gray hat and black hat areas will hurt you in the long run, according to Ali Husayni, the CEO of the SEO service company, Millionairium. Heed the warning of Google’s anti-spam strategy: they can distinguish between black hat and white hat SEO techniques, and your rank will rise and fall accordingly. After all, the battle lines between white hat, gray hat, and black hat techniques are drawn quite clearly, so pick an SEO practice and stick with it, urges Schottmuller, using Star Wars as an analogy. Our strong suggestion: do your search engine optimization efforts justice by sticking with white hat techniques. Nice post regarding SEO, it helps me a lot, keeps posting like this. Thanks Megan for this informative post. Black Hat SEO and white Hat SEO are really very important and I find white Hat SEO to be much safer and I would opt for that only. Thanks for the share. Very informative about Black Hat Seo and White hat SEO and how its works.Thanks a lot for sharing this. rightly explained…i came to know lot of people use to practise keyword stufing ,so what would it result tot heir site ? ?